HOUSTON, Dec. 27, 2018 (GLOBE NEWSWIRE) -- QS Energy, Inc. (the "Company" or “QS Energy”) (OTCQB: QSEP) is a developer of integrated technology solutions for the energy industry. The following is a shareholder update from Jason Lane, Chief Executive Officer and Chairman of the Board, QS Energy, Inc.
First, to all our shareholders, Happy Holidays. Our team at QS Energy wishes you all the very best in 2019 and what we hope to be a very prosperous new year. As we approach year-end, I would like to take this opportunity to look back at our strategic goals and accomplishments of 2018, where we are positioned today, and our plans to achieve industry acceptance and commercial deployment of our AOT technology in 2019. As noted in previous shareholder updates, we have worked throughout 2018 on our primary strategic goal to install and operate a demonstration or “pilot” AOT project on a high-volume commercial crude oil pipeline, targeting commercial deployment and sales in 2019. Much of our time was spent meeting with industry executives and engineers in North and South America and working with local representatives in the Asian and the Middle Eastern markets. 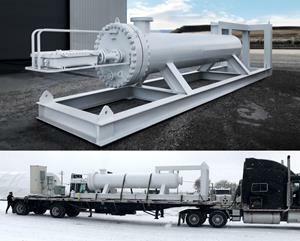 Although it took longer than anticipated, we have reached mutual agreement with a major U.S.-based pipeline operator on a demonstration project and are now prepared to deliver and install our AOT equipment on a high-volume crude oil pipeline located in the Southern United States. The selected project site should be ideal for demonstration purposes, delivering high-volume heavy crudes which, based on samples tested at Temple University, should experience significant viscosity reduction when treated with our AOT technology. While management focused on finding a partner and finalizing terms of the demonstration project, our engineering team worked to improve our AOT design and prepare one of our inventoried AOT units for deployment. In November, after finalizing system upgrades, our engineers performed a detailed inspection and ran a series of high-voltage quality control tests in a dry-run state. Results of the high-voltage tests were of particular interest, demonstrating improvements in the expected efficiency and reliability of the modified AOT unit. In early December, high-pressure hydro testing was successfully performed by a third party. Upon completion of inspection and testing protocols, the modified AOT was certified for operations and is now ready for delivery to the demonstration site. We expect site preparation (foundation, electrical interconnect, etc.) to begin in January, with delivery, installation and operations to begin shortly thereafter. As a side note, I would like to give a special thanks to two of our supply chain partners located in Casper Wyoming, Industrial Screen and Maintenance, Inc. and Power Service, Inc., for their timely and efficient work on recent AOT modifications. The attached photos of the AOT prepped and ready for delivery show the results of their quality work. Plans moving forward are centered on achieving commercial adoption of AOT leading to sales and revenue in 2019. Over the past year, we have met with many industry executives who expressed interest in AOT subject to seeing and evaluating commercial operations and data. Assuming successful operations, the pilot AOT project should provide data requested such as real-time changes in viscosity, pipeline pressure drop reduction and increases in pipeline operating volume or flowrates. All collected data will be normalized such that it can be used to evaluate the financial and operational benefits across a wide range of commercial operating scenarios without disclosing confidential details of our demonstration partner’s operations. This real-world data would be used to accelerate commercial adoption, positioning us to re-engage with industry executives, targeting sales in mid to late 2019. In addition to our ongoing direct sales and marketing efforts, we plan to work with public and investor relations firms in 2019 in an effort to expand our market reach and more deeply engage with the investor community. Armed with data from the demonstration project, we believe coordinated industry and investor outreach through publications, conferences and distribution of whitepapers and other marketing materials can be leveraged to greatly expand awareness of QS Energy and our technology.